Today we've got a special guest sharing an awesome tutorial: Kara from Happy Go Lucky. Let's give her a big welcome and check out this fun project. Take it away Kara!! Hi all you lovely Sew Can Do readers!! I'm so excited to be a guest today. My name is Kara and I blog over at Happy Go Lucky. Today we are going to make this fun bowl! Can you guess what it's made out of? Did anyone guess a vinyl record? I wanted a fun, cute fruit bowl that wasn't too expensive. After looking around for inspiration, I decided to combine two ideas that I came across: a vinyl record bowl and a rope bowl. Heat oven to 200 degrees. Then place the record on top of the glass bowl. I also placed my bowl on a cookie sheet so it was easier to put in and take out of the oven. Place in oven for about 8 minutes. Remove from oven. Turn the bowl over and place record inside bowl. Place back in oven for about 5 minutes. Take out and push record inside of the bowl. Let cool and then remove from bowl. 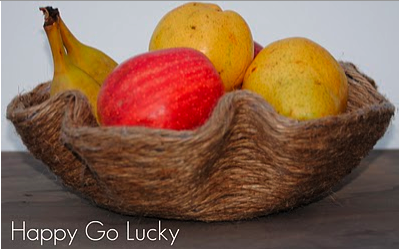 Heat up our glue gun and start gluing the jute rope to the vinyl record bowl. I started on the bottom outside of the bowl. Just keep putting glue on the vinyl record and gluing the rope to the bowl. And keep gluing and wrapping. Once you reach the rim of the bowl, start gluing to the inside. Then fill your adorable, unique bowl with whatever you want! This bowl cost around $5.00 to make. The vinyl record was $1.00 from a local thrift store. The rope was around $3.00 and I needed glue sticks that I got for $1.00. Can't beat that price!! So what do you think? My favorite part is that it isn't perfectly round and each bowl would be different. I hope this inspires you to make your own bowl using a vinyl record and jute rope. Thank you so much Cheryl for having me today. It has been an honor and a blast to be on Sew Can Do! You rock!! If you get a chance, I'd love to have you stop over Happy Go Lucky and say "Hi!" Thanks for sharing this Kara!! Cute! I'm going to pin this! I love the finished look of the bowl - much more interesting than just a plain round one.